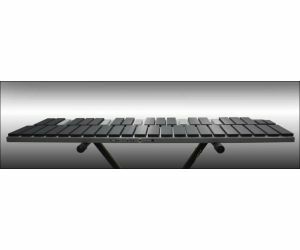 KT Series eDrum/Pads :: Electronic Drum Sets :: KAT KT3 Digital Drumset - Alternate Mode, Inc.
Ketron SD1000 Sound Modules are back in stock! 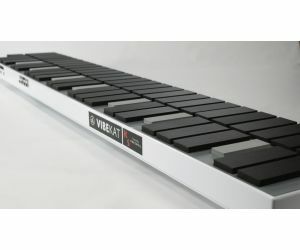 Limited Quantities of the Yamaha Motif XS are still available. 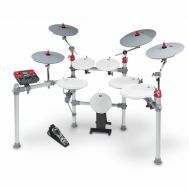 The new 6-piece kt3 digital drum set represents KAT's latest advancement in its "kt" drum series. This "big brother" edition of the widely acclaimed kt2 features large 11" white floor tom and snare drum pads, a larger 12" hi-hat cymbal, two 12" crash cymbals, a 14" ride cymbal with an all-new bell trigger and most importantly, a new library of amazing, high quality sounds. The built-in general MIDI sound card includes a variety of play-along songs that are both fun and challenging to play. The sophisticated kt3 sound module includes 45 pre-configured drum sets, 25 user-programmable drum sets, 100 built-in play along songs, and 550 studio-quality drum, cymbal, DJ, EFX, and percussion sounds. 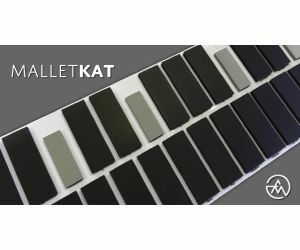 The kt3 module has as much connectivity as you have come to expect from a KAT kit. A pair of 1/4" stereo output jacks accommodate direct recording and mixer amplification. A stereo input jack allows you to plug in your mp3 player so you can play-along and practice to your favorite tunes. - Tempo adjust and more. The 1/8 " audio input jack allows you to connect a CD player, MP3 player, smartphone or tablet, allowing you to play along with your favorite tunes. Two (2) 1/4" output jacks conveniently plug into a PA system or console for studio recording or live performances. 1/8" stereo output jack for your headphones or in-ear monitors for private playing. 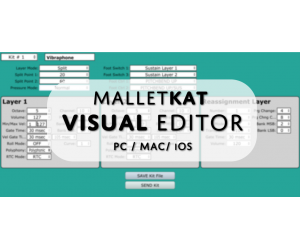 Alternate Mode is extremely excited to offer its long anticipated FREE malletKAT Editor for the malletKAT Express, Pro, Grand and vibeKAT. In the next few months, we will be transitioning the powder coating metal and sensor overlays of our malletKAT, vibeKAT and trapKAT products to a new, bright white body. This beautiful and contemporary look is further enhanced by also including a solid black nylon coating atop of the pads. This coating is not just aesthetic, but provides additional protection of the pads from the sun, rain, and general abuses. This year, Young Chang, the maker of the Kurzweil sound card, unexpectedly decided to stop manufacturing the sound card for Alternate Mode. We still have some left, but will soon no longer have the KS available as we want to keep a supply of repair boards available. Ever since the Malletstation was announced last November, many comparisons with the malletKAT were posted on social media. It’s amazing that comparisons were made even before the instrument was released! Now that the product is on the market, it’s time for a more thorough investigation. © 2004-2019 Alternate Mode, Inc.. Your city is Fairfield. Is it correct?